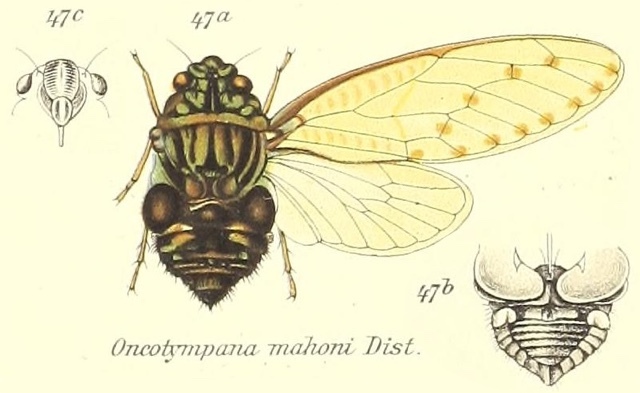 Hyalessa mahoni (Distant, 1906) is a cicada found in India. Its name changed from Oncotympana mahoni to Hyalessa mahoni, when it was moved to the Hyalessa China, 1925 genus. The Oncotympana Stål, 1870 genus still exists. Interestingly, the Hyalessa genus belongs to the Sonatini tribe and Oncotympana belongs to Cicadini. The image says Hyalessa mahoni, but the newest name for this cicada is Oncotympana mahoni.